That the American Quarter Horse is a favourite of mine is no secret. Traditionally rather short in both height and whttp://sbiapps.sitesell.com/sitebuilder/blockbuilder#2065980idth I love the "square look", typified by my little horse Tyra (Smart Little Emily, shown in the pictures further down). Quarter horses combine power with elegance, agility and gentility, with a temperament more akin to a friendly puppy dog than a horse. Bred for ranch work in the week and racing up the main street during the weekend the Quarter Horse can turn on a dime, and accelerate and stop at phenomenal rates. 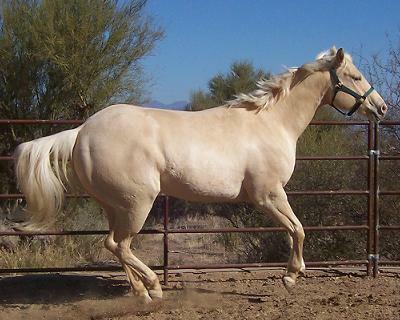 My cremello American Quarter Horse Kitty (Holly Cream Cat, photos below) would typically gallop over from a far corner of a field to see me, skidding to a halt just inches from me. Rather disconcerting at first, but she always stopped just in time! When Kitty was young she once presented me a present - a stick - as I came into her field. If a horse can look pleased with herself, she did! When she was a foal I'd take her for a walk after breakfast and a groom. Often she'd pick up her halter from the stable corner and give it to me as I entered, having just returned from taking the grooming brushes to the tack room next door. It was if she was saying "Here - time to go for our walk now!". She was very nosey and loved it when there were neighbours around to stop and talk too, especially as it meant she was generally made a fuss of. The neighbours joked that if Kitty was any more laid back she's be horizontal, but that descendant of a world speed record holder could run like the wind if you asked her to. 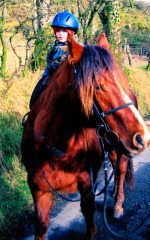 My mare Tyra (photos below and in the next article) was also a cool horse with an amazing turn of speed. Very soft to handle I could clean her feet out while she was laying down in the field, and sometimes I did just that. 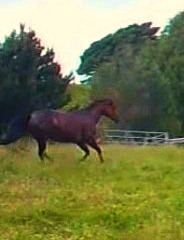 My horses and I enjoyed a bit of trick training for fun. It improves their learning ability, their agility and helps with teaching ground tying, as well as a few things that can turn out useful on the trail (such as when they can have a drink). Tyra quickly learnt that a few tricks earned her attention and praise. She would smile a the neighbours as we stopped to say hello, shaking her head vigorously when I asked her if she was a good girl. When I walked into her field she'd come over and greet me with a smile. One day while I was teaching the Dartmoor pony to count and mount a pedestal she came over to see what the fuss was about. In a few minutes she'd copied the pony, learning both tricks although she was completely at liberty and could have gone back to graze with the others any-time she'd wanted to. The jury is still out on whether the American Quarter Horse is the first breed to be produced on American soil. Regardless, if it wasn't the first horse to be bred here it was certainly one of the first, and its history traces back to before the earliest days of the American colonies, back to the official royal breeding farms established here by the Spanish. Today, according to the American Quarter Horse Association (AQHA), there are more than 4,000,000 Quarter Horses registered worldwide, and approximately 150,000 Quarter Horse foals registered each year. 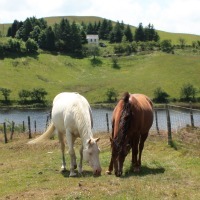 The Quarter Horse has a rich and varied pedigree, including Spanish Barbs, Colonial mid-Atlantic Quarter-Pathers, English Thoroughbreds, Andalusians, Mustangs, and Rhode Island Racing Stock, to name just a few. 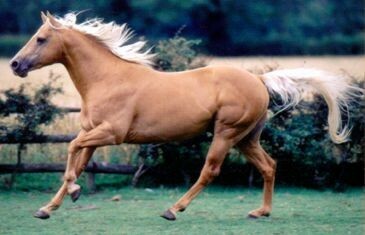 While the Quarter Horse was established before the English Thoroughbred could have a significant influence on early breeding, the greatest influence on early Quarter Horses was Sir Archy, a distance horse to whom many of the greatest 19th and 20th century Quarter Horses can trace their lineage. While Quarter Horses were initially used to race in shorter style races on the eastern seaboard, the longer, four-mile heats that came into fashion in the 1850s pushed the Quarter Horse to the sidelines while leggier horses such as the Thoroughbred prevailed. 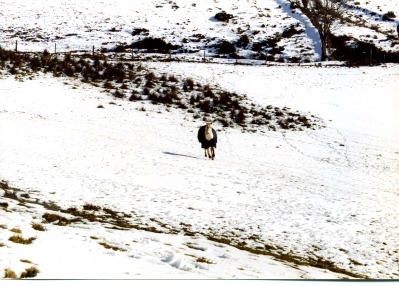 The Quarter Horse may have all but died out if settlers moving West hadn't capitalized on the strength, quickness, and athleticism that made them naturals for pulling wagons and plows, managing livestock, and doing ranch work. As cattle ranching became in indispensable industry in the United States, so did the Quarter Horse. Quarter Horse range in height from 14.2 hands to 17 hands, and typically weigh 1,000 to 1,500 pounds. 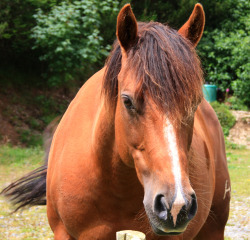 The Quarter Horse is known for its short, fine head with small, alert ears and alert eyes set wide apart. 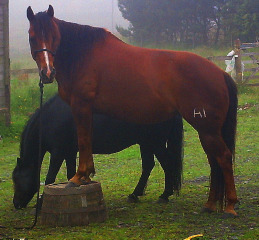 The profile of the Quarter Horse is usually straight. 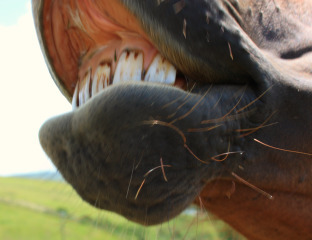 The neck of the Quarter Horse is well-muscled, well-formed, and a bit arched. Well-defined withers are set prominently into a short, straight back. The croup is usually strong, muscular, and rounded, and drops subtly to the haunches. 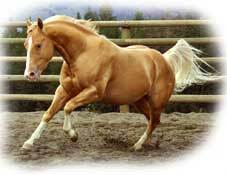 The wide, deep chest and long, muscular, and well-sloped shoulders are other characteristics of the Quarter Horse. 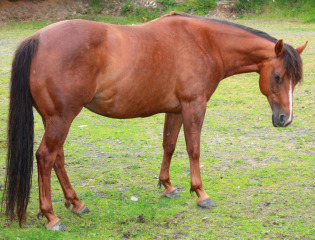 The legs of the Quarter Horse are usually solid and well-formed, with very muscular thighs, gaskins, and forearms. The joints are broad and clean. Quarter Horse feet are usually strong and sturdy, though they can sometimes be smaller than body size warrants. 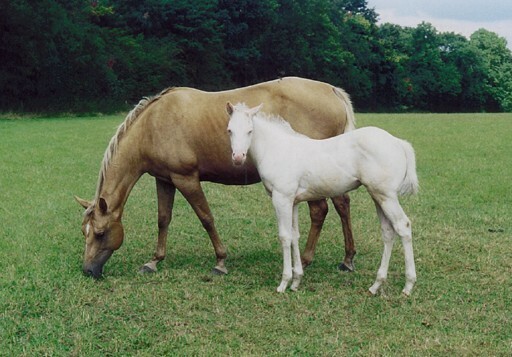 The most common color for Quarter Horses is sorrel, which makes up about one-third of all registered horses. The AQHA also recognizes bay, black, brown, chestnut, dun, red dun, grulla, buckskin, palomino, gray, red roan, blue roa, bay roan, cremello, and perlino. White markings on the face and lower legs are not only permitted, they are quite common. 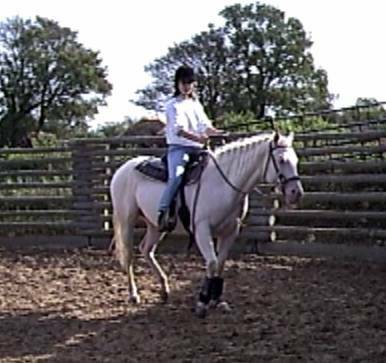 AQHA does not allow white above the knee or hock, and white body patches are also not allowed. The fact that Quarter Horses started out as short-distance race horses on the East Coast, moved to the West to specialize in ranch work, and now excel in every discipline imaginable is testament to the breed's amazing versatility. While the breed is still best suited for ranch work, short distance racing, cutting, and reining, you can find Quarter Horses in the hunter jumper, dressage, park saddle, pleasure, and trail disciplines. 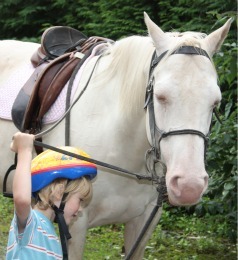 Quarter Horses also have wonderful, willing, and calm temperaments and are good for riders of all ages and abilities. 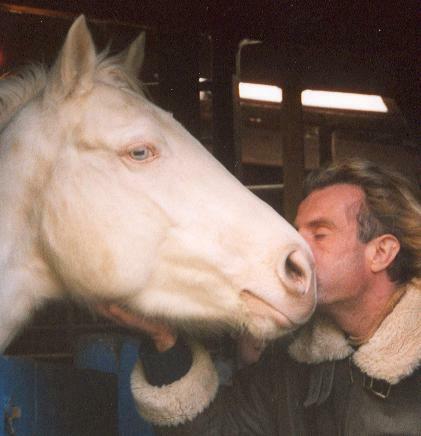 Ron Petracek is the founder of Equine Internets vast 15 site classified and social network. 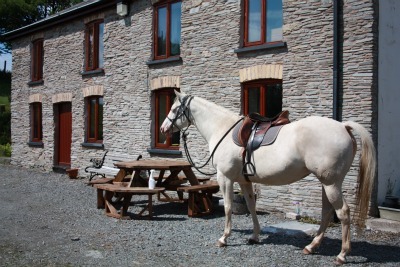 You can view its amazing size here Http://www.equineinternet.com/network.php or to further your equine habit please visit our forum by clicking here http://www.horsechitchat.com/equineforums and start posting Need to sell a horse or tack? 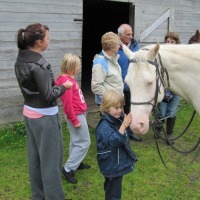 place a free ad here http://www.click4equine.com and always the barn door is left open on purpose.